George H.W. Bush's Wartime Experience Shaped His Approach To Politics The World War II generation had a sense of serving the country together and also shared a belief in professionalism, one historian says. Still, Bush was not afraid to get personal with campaign foes. President George H.W. 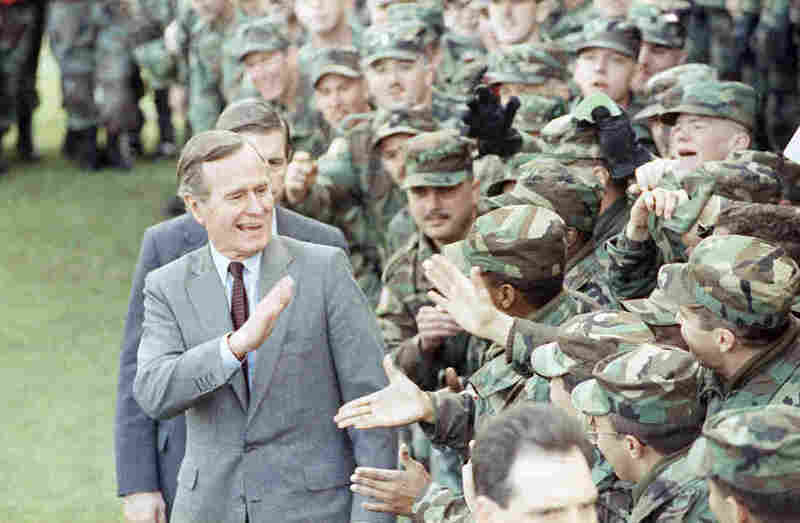 Bush greets soldiers at Fort Stewart, Ga., after he addressed family members of the 24th Infantry Division stationed in Saudi Arabia and personnel at the facility in February 1991. George Herbert Walker Bush was the 41st president of the United States, but in many ways, he was the last of his kind. Bush, who died Friday at 94, was the last World War II veteran to serve in the Oval Office, and he presided over the end of the long Cold War with the Soviets. He was also the last person raised within the confines of the once politically dominant "Eastern Establishment" to attain the presidency. "A real transition, one might say, came with the conclusion of Bush's term," says presidential historian Robert Dallek. Bush's background and history made him temperamentally different from his successors. But to the extent that he was a transitional figure, his story is not all about old values being left behind. Bush was an aggressive campaigner, willing to attack his opponents in highly personal terms. His presidential races helped set the template for the kind of politics that followed. His one successful presidential run, in 1988, represented the first time, according to Time magazine, that "attacks on an opponent, rather than promotion of one's own agenda, [became] the primary target of a presidential campaign." His successors have had their share of degrees from Harvard and Yale, but Bush was thoroughly a product of the WASPy aristocracy of the Northeast — a graduate of Andover and Yale, the son of a Connecticut U.S. senator, the scion of two Wall Street banking dynasties. 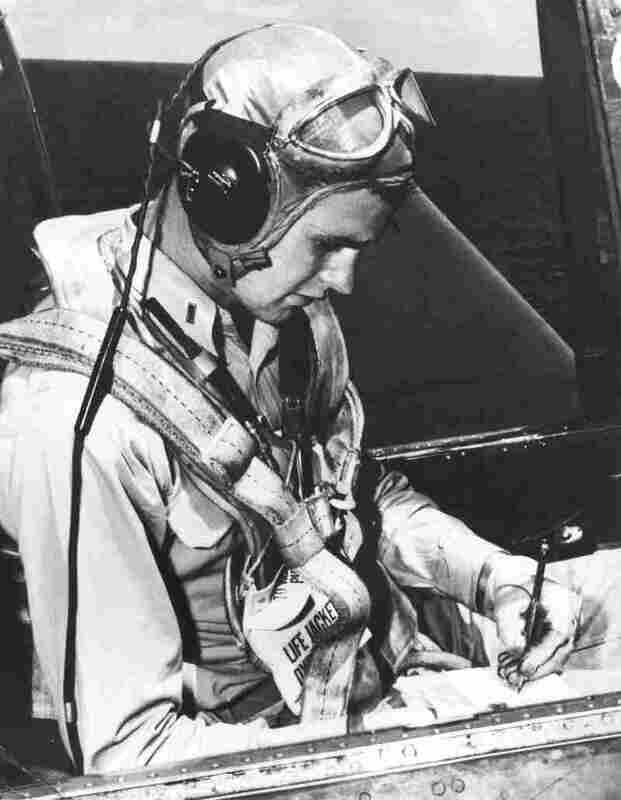 Bush, pictured in the cockpit of his TBM Avenger during World War II, enlisted in the Navy on his 18th birthday and became one of its youngest pilots. Bush was inspired by a speech at Phillips Academy Andover given by Henry L. Stimson, a two-time secretary of war and "kind of a god in those Northeastern circles," says Geoffrey Kabaservice, author of Rule and Ruin, a book about moderate Republicanism. "Hearing Stimson talk about patriotism and American values was one of the things that impelled Bush to enlist," says Lewis Gould, a historian of the Republican Party. "He was impelled by a sense of duty and put himself in harm's way, and his life goes in that direction." Bush enlisted in the Navy on his 18th birthday, soon becoming one of its youngest pilots. He flew nearly five dozen missions. 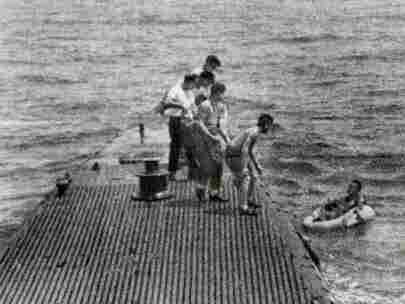 He was shot down on Sept. 2, 1944, over the island of Chichi Jima in the Pacific and floated on a raft for a couple of hours before being picked up by a submarine. Bush always "became very, very emotional whenever he talked about the military," says Chriss Winston, his chief White House speechwriter. After a 1989 explosion on the USS Iowa killed 47 crewmen, Bush delivered a speech in which the emotional high point was intended to be a line in which he talked about his own experience taking off in the morning and coming back to an empty deck. But he couldn't deliver the line and skipped right over it in his prepared text, Winston recalls. "In speechwriting, we learned we had to tone down the actual remarks and not make them as emotional because he simply couldn't get through it," she says. Bush was the last of an unbroken 40-year line of presidents who had served in uniform during World War II, starting with Dwight D. Eisenhower, the former supreme Allied commander. "That's why members of Congress got along better in the old days," Kabaservice says. "A lot of them had fought in World War II and they looked at each other not as partisan enemies, but people who had been comrades in arms." The World War II generation had a sense of serving the country together and also shared a belief in professionalism, says Jeremi Suri, a University of Texas historian. "Bush was the last president who believed that people who had knowledge and experience should make decisions based on that and not on their ideological views," Suri says. "It was a businessman's approach to making decisions about leadership. You appoint and promote the person who's most qualified over the person you might agree with more." His generation might have had suspicions about political rivals but accepted them as part of the landscape, Gould says. There was no shame in making deals with politicians from the other side of the aisle. That partly explains why the Republican was willing to violate his "no new taxes" pledge with the budget agreement of 1990, which hurt him politically yet set the stage for a decade of increasingly sound federal budgets. "Bush was viscerally connected to the notion that there were men of goodwill on both sides of the aisle," Gould says. " 'This is in the interest of the country, so despite my tax pledge, which I won the presidency in making, circumstances have changed and I'll take the political risk.' "
Throughout his political career, from his Texas campaigns for House and Senate in the 1960s through his presidential runs in the 1980s and 1990s, Bush was willing at times to be expedient and adopt more conservative stances on fiscal and social issues than he appeared to hold while governing. 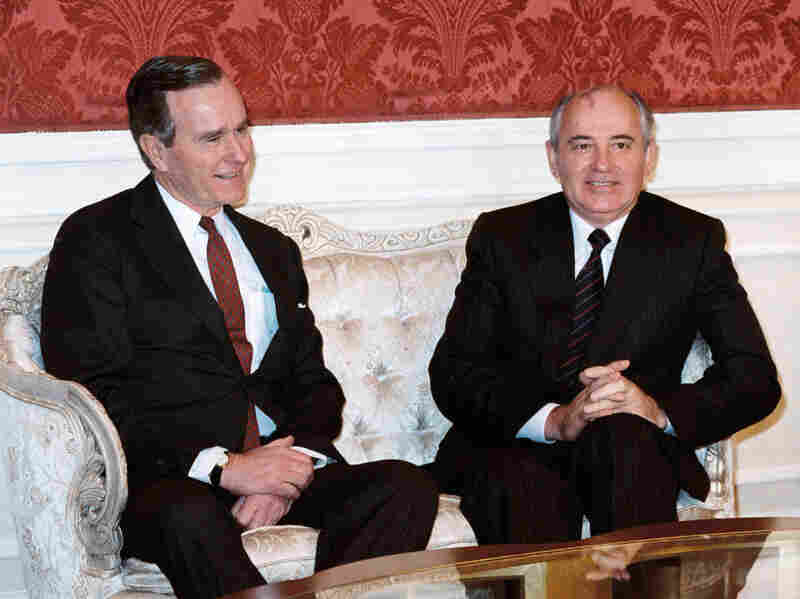 Bush, who was vice president at the time, met with Soviet leader Mikhail Gorbachev during a 1987 summit in the U.S.
Bush quietly gave space to Mikhail Gorbachev, president of the Soviet Union, to allow that country to adjust to the decline in its fortunes and influence. Bush did not threaten, make grandiose pronouncements or gloat, Robert Gates wrote in his memoir From the Shadows. Gates was Bush's CIA director and later became secretary of defense under Bush's son and President Barack Obama. "As the communist bloc was disintegrating, it was George Bush's skilled, yet quiet, statecraft that made a revolutionary time seem so much less dangerous than it actually was," Gates wrote.